Arriving at what will be the most unusual performance venue we've ever experienced. 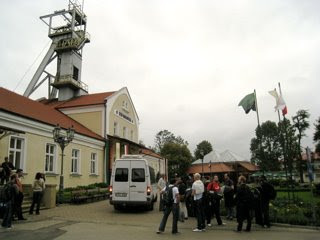 This Salt Mine has been active ( and still is) since the 14th century, is open to visitors. In side is the Chapel sculpted by miners out of the salt in the l9th Century, called the St. Kinga Chapel. The sculptures, made by miners, are of salt, and the crystals in the Chandeliers are salt crystals.